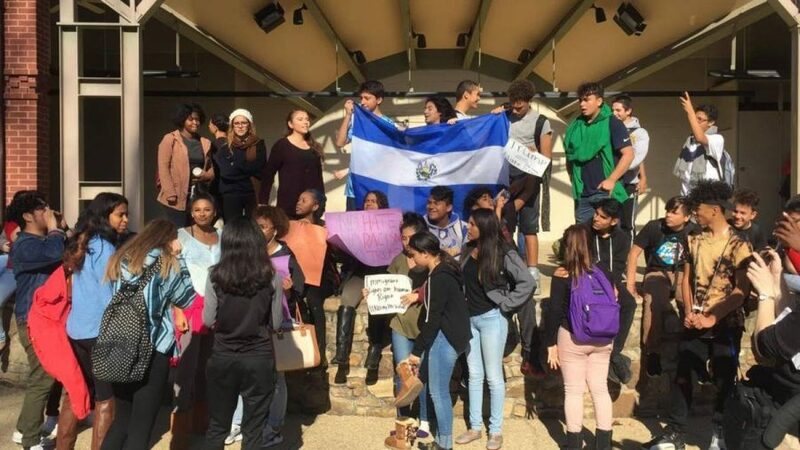 Students, many from Watkins Mill and Gaithersburg, wave flags and signs to express support and pride for immigrants and minorities during a walkout protest Nov. 18. Photo courtesy the Current. 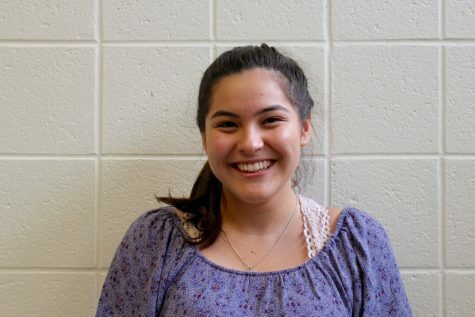 Despite MCPS and school administrations’ attempts to prevent future school walkouts, some Watkins Mill and Gaithersburg students were still determined to make their voices heard. The day after superintendent Jack Smith asked for students to cease school demonstrations due to safety concerns, students from Watkins Mill and Gaithersburg organized a walkout together, meeting up at Lakeforest Mall and marching all the way to Gaithersburg City Hall Nov. 18 to protest what they felt had been an intensification of hate speech and crime since President-Elect Trump’s victory in the election. Smith addressed students in a video played in classrooms after three consecutive days of countywide student demonstrations culminated in the assault of a student at a Richard Montgomery walkout Nov. 16. Smith contacted Watkins Mill Principal Carol Goddard directly when he heard of students’ plans to demonstrate, asking her to take measures to prevent the protest, junior Aaron Dunkins said. Dunkins organized the student demonstrators from Watkins Mill. The Black&White reached out to school and county administration, but could not confirm this with them. Goddard, Dunkins and the police actively communicated with one another to ensure that students were kept safe during the demonstration. The potential punishments Smith warned students of in his address were left to the discretion of individual principals, MCPS spokeswoman Gboyinde Onijala said. Students from Watkins Mill and Gaithersburg were only given unexcused absences, which could be excused with a note from a parent. 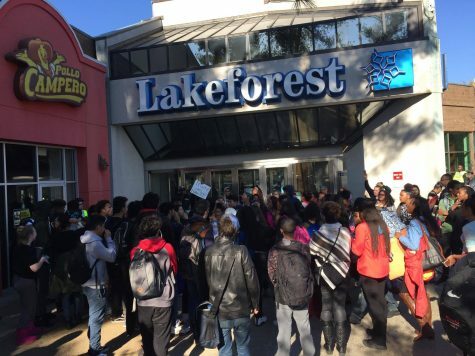 Crowds of students from both Watkins Mill and Gaithersburg high schools came together at Lakeforest Mall. Photo courtesy the Current. While the demonstration proceeded peacefully, onlookers from the surrounding community weren’t necessarily supportive. Many jeered and taunted the students from cars as they passed by, chanting “Let’s go Trump” and “Go to school,” said Watkins Mill junior Chase Deist, who is associate editor for the school’s paper, The Current, and helped cover the protest. In contrast to the Watkins Mill and Gaithersburg’s’ protestors general success, when Wootton students attempted to organize a walkout Nov. 17, the protest fell through due to a lack of organization and a direct request from the principal that students refrain from participating. Though students understood concerns about safety, some found Smith and the school administration’s stance against the demonstrations disheartening. While some students were deterred, those who protested claimed their cause was worth defying the superintendent. Some even argued that while the walkout caused some students to miss class instruction it was an educational experience within itself.